Huntington Beach location of a “build your own burger” restaurant offers casual fare and an expansive craft beer selection. : SLATER’S 50/50 IS RELOCATING TO 17071 BEACH BLVD., HUNTINGTON BEACH. Unlike the strip-mall confines of the original Anaheim Hills location, this Huntington Beach outpost of the “build your own burger” restaurant is housed in a detached space. This difference is used to full advantage, as the venue has a much larger, breezier interior, outdoor seating and a more relaxed yet still lively atmosphere that is ideal for locals who want to hang out but don’t feel like dealing with downtown HB’s shenanigans. The inviting, centrally placed bar has a perpetually rotating list of nearly 80 craft beers, ranging from national labels to those from local breweries. 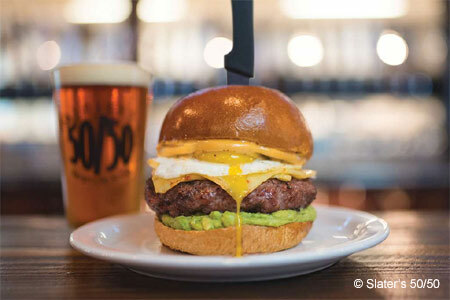 While people are drawn in by the allure of constructing their own burger or trying Slater’s signature “50/50” beef and bacon patty, the list of pre-designed fare shines rather brightly, particularly the cola-braised pork shoulder sandwich and the odd-until-you-try-it peanut butter and jelly burger. Large groups should round up a couple of appetizers; we recommend the roasted garlic and artichoke Vampire Dip. If you are looking to end your meal on a sweet note, indulge in the massive chocolate bacon brownie. And surprisingly enough, the venue has a pretty solid gluten-free menu. Other locations.